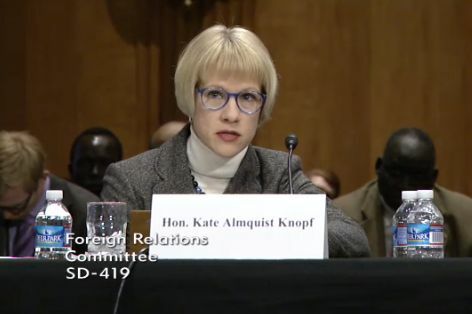 On January 9, 2014, Kate Almquist Knopf, Former USAID Assistant Administrator for Africa and adjunct professor at the Africa Center for Strategic Studies, testified before the U.S. Senate Committee on Foreign Relations on the volatile situation in South Sudan. In her testimony, Professor Almquist Knopf—who recently authored an ACSS research paper on South Sudan—assessed the current crisis and offered several recommendations both for short- and long-term gains. Accept a U.N. Commission on Inquiry to document human rights abuses. Put the citizen’s interest at the heart of government’s action by responding first and foremost to citizen’s priorities. The U.S. Senate convened the hearing on South Sudan in an attempt to help U.S. lawmakers better understand the broader implications of the current crisis and the road to a political solution. Other panelists included: Ambassador Linda Thomas-Greenfield, Assistant Secretary of State for African Affairs; Ms. Nancy Lindborg, USAID Assistant Administrator, Bureau of Democracy, Conflict and Humanitarian Assistance; Ambassador Princeton Lyman, Former Special Envoy for Sudan; and Mr. John Prendergast, Co-founder of Enough Project.